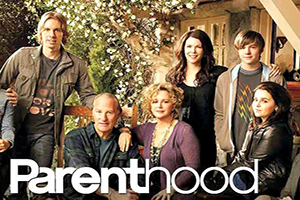 If you haven’t been watching this season of Parenthood on NBC Tuesday nights, you’re missing out. I first began watching Parenthood because of Dax Shepard. Dax was part of the team on Ashton Kutcher’s Punked. Dax was weird, but in a good way. So there I was, switching channels, when I came upon Dax in a new show about a white family. Having grown up on shows about white families such as Little House on the Prairie, Roseanne, Punky Brewster, 7th Heaven, and The Cosby Show (as a kid it didn’t occur to me that the Cosbys were African-American, rather they were just American), I slid right into the Parenthood clan: parents, four siblings plus spouses plus children. Dax plays a ditzy younger brother and I may have yet changed channels except that a) one of Braverman couples have an autistic child and I was interested in seeing how this character would be portrayed. b) Dax has just discovered he’s a father of an African-American child. c) I’m always a sucker for any race relations stories and Parenthood addresses theirs with a gloss free honesty and integrity. But then this is the way it tackles all topics. This current season, season 4, Kristina Braverman, mother of three, has breast cancer. Parenthood not only shows a bedraggled woman puking all over the stairs but also a young woman facing her own mortality. Medical marijuana also makes an appearance. A new character, a war veteran, in relating a war tale indicts American foreign policy, but in a fashion which illustrates the emotional costs to the citizens of both countries. I hope Parenthood does not take this character into cliche’s path and, given their track record, I don’t think they will. For instance another Braverman couple adopts an older South American child out of the foster system. What follows is yet another terse but riveting look at race relations, as well as adoption, albeit with moments of tenderness and levity. Of course the actors are terrific and the direction excellent but, as in everything, it’s the writing, so thank you writers. Parenthood is not perfect, few things in life and on TV are, but this show comes quite close.